7-Eleven's Your Good Call is a members-only space where 7-Eleven customers chat about all things 7-Eleven and chip in on exciting projects in the works. No doubt you've had times when you've walked in a 7-Eleven store and had opinions about how 7-Eleven could be a smidgen better. At Your Good Call, we're all ears when it comes to honest feedback. WHAT ACTIVITIES CAN I PARTICIPATE IN ON THIS SITE? Quick Polls – these are short polls that change fortnightly, they are just a cool way to see how your fellow Good Callers think. Questionnaires – these are longer surveys that might ask for your opinions, perceptions and answers on events, brands, products and any other questions we have for you. In-Store Surveys – these involve going into a 7-Eleven store and carrying out a task. For example, you could be asked to take pictures of the layout of the store or the displays on a shelf. You could also be given vouchers to purchase a certain product from a 7-Eleven store and give us feedback on that product. Video tasks – these involve a video submission on a particular topic. Often ranging from 1-10 questions. These tasks sometimes receive additional incentives but we will often hope you can contribute out of the kindness of your own heart. WHY IS 7-ELEVEN DOING THIS? This is all about listening to you. We want to make 7-Eleven a better place for you, and we can't do that without your input. But we also realise there has to be something in it for you too. That's why there are coupons, free products and lots more. If this sounds like something you'd like to get involved in, just fill out the short survey to register your interest. IS THIS WHERE I CAN ASK 7-ELEVEN A QUESTION? 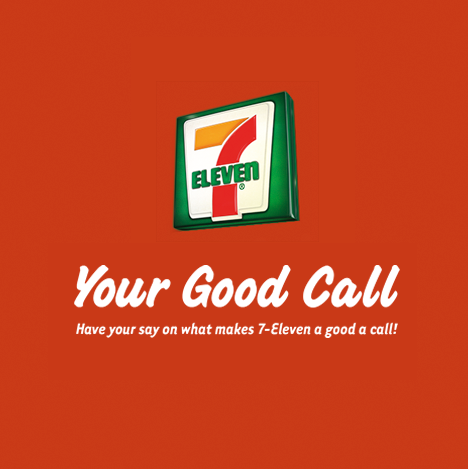 Your Good Call is an online space dedicated to sharing and discussing ideas and opinions and allowing you to see how 7-Eleven is putting opinions and top ideas into action. If you'd like to ask a question or make a comment specific to your experience with 7-Eleven, please visit the Contact Us section of www.7eleven.com.au. WHAT HAPPENS TO MY OPINIONS AND INFORMATION AFTER I SUBMIT IT? We've got a dedicated team of insights managers who will read all ideas and comments. They'll consolidate your opinions (whether you're in the minority or majority), as well as the most innovative ideas that are the best fit for 7-Eleven. These will be presented to key decision makers within the company to determine how we put your opinions to work. Rest assured, your opinions are maintained in complete confidence and your personal details are secure and confidential. CONFIDENTIALITY - WHY IS YOUR GOOD CALL A CLOSED SPACE? WHY DO I HAVE TO REQUEST AN INVITATION? Just like in a tête-à-tête, we simply like to know who we're chatting to! Also, the information we share with you is confidential; we don't want the information on this site shouted from the rooftops (or on Facebook or Twitter). So, whilst we appreciate every person's opinions, we have to keep this a closed community. Please see our Terms and Conditions for more information. Monthly vouchers, quarterly prizes and the end of year silent auction all depend on how many points you earn. To learn more about the rewards system, please see Your Goodies for more information. If we implement your idea, we may give you credit on the site, but we won't be compensating customers if their ideas are chosen. To learn more about this, please take a look at our Terms and Conditions. WHO ARE THE YOUR GOOD CALL MODERATORS AND HOW DID YOU CHOOSE THEM? The Your Good Call moderators are employees on 7-Eleven's insights team. We have vast experience in a range of areas, from new product development, to food service, to panel programs, and many others.